A one day workshop entitled “Answering the Challenges: The Role of Innovative Science in Building a Sustainable Future” had been conducted at University of Indonesia campus, Depok. 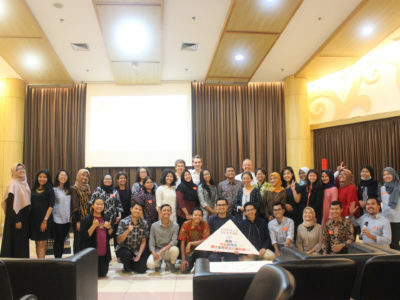 Hosted by Faculty of Mathematics and Sciences (FMIPA) UI, this workshop was a result from collaboration between Indonesia and Sweden which shared the same ideas of innovation and sustainability. The workshop was held at Balai Sidang UI on June 2nd, 2014 and started with the opening remarks by H.E. Ambassador of Sweden and Prof. Dr. Muhammad Anis, M.Met. (Rector of UI). The line of speakers included Prof. Dr. Bambang P. Brodjonegoro (Vice Minister of Finance), Prof. Dr. Niclas Adler (President of I3L—Indonesia International Institute of Life Sciences), Prof. Dr. Jan Sopaheluwakan (Indonesian Institute of Sciences), Prof. Dr. Sangkot Marzuki (Eijkman Institute of Sciences), General (Ret.) Luhut B. Pandjaitan, MPA (Leader of Bhakti Pertiwi Foundation), Dr. Nurul Taufikurahman (Director Center for Innovation at LIPI), and Dr. Dadang Rukmana (Director for City Planning, Ministry of Public Works). In the afternoon session, Prof. Emil Salim has made a special appearance at the workshop.